Welcome to Nova Terra Cotta virtual showroom! Joan Bruneau established her studio and showroom, Nova Terra Cotta, in Lunenburg Nova Scotia, Canada in 1995. Her fine studio pottery is available exclusively at Nova Terra Cotta open from May through December and also through the virtual showroom. 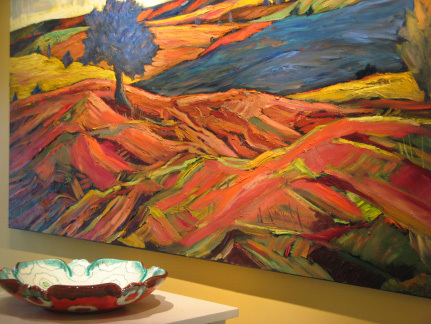 We are very pleased to represent celebrated Canadian artist, F. Scott MacLeod at Nova Terra Cotta. MacLeod’s bold and vibrant paintings create a lively dialogue with Bruneau’s rich and varied glaze palette in the showroom and at home. Visit the Virtual Showroom to view current paintings available.